There are no Fells that are truly "wild" in the sense of "belonging to no-one". Every pony is owned by someone, though they may be running semi wild on hundreds of acres of common land. The local farms that have "fell rights" give their owners commoners' rights to turn-out ponies on the fell. However, on some fells the Ministry of Agriculture (now DEFRA) compensated farmers for every pony removed and not replaced on the common land. This was intended to reduce the stocking rates on the fell and to allow natural regeneration of damaged herbage. Foot and Mouth devastated much of Cumbria's sheep stock in 2001 and the change in the grassland was accelerated. The fell land looked startlingly different in 2002 - not bowling-green lawns, but waving stands of flowering grasses and thistles. Visitors in that year could not believe how lush everything was, and that Fell ponies are adapted to a normally much sparser diet! 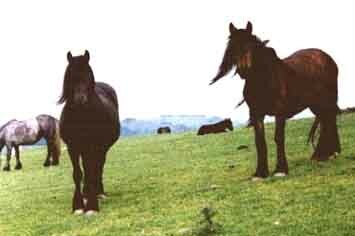 "Now, it is just this breeding true to type [of the General Stud Book for the Thoroughbred horse] which one is apt NOT to get in other breeds, unless it be with the mountain and moorland ponies aforesaid, which, left to run in a semi-wild state and breed according to natural selection, seem to retain their type from generation to generation." Adye, 1903 ed. All three are available from the Fell Pony Society's Merchandise page.